Microsoft kicked off its E3 conference this morning with the most open look at Gears of War 4 yet. Dynamic weather, big new weapons, and is that the wrinkled fogey face of Marcus? Probably. New Story, Heroes and a Nightmare Reborn: The first chapter of an all-new “Gears” saga thrusts players into an epic and perilous journey through the wilds of Sera. 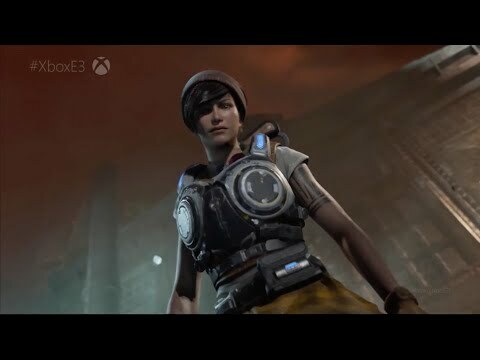 Fight as JD Fenix – son of the legendary hero Marcus Fenix – as he embarks on a desperate mission with his friends Kait and Del to find their missing loved ones and confront a fearsome new threat. Never Fight Alone: Rev up your Lancer and fight your way through the Campaign with a friend over Xbox Live or via local split screen co-op, with the option to play as JD, Kait or Del. Cross Play lets Xbox One and Windows 10 gamers play together in cooperative modes like Campaign, Horde and Co-Op Versus. Shared Progression and Achievements with Xbox Play Anywhere across Xbox One and Windows 10: Cloud saves enable you to switch seamlessly between both versions of game, giving you the freedom to play where you choose. Both versions are included with a single purchase. Fight through a Dynamic and Deadly Environment: Brace yourself against ferocious windflares that blow away cover, bend your shots and drastically alter the battlefield, forcing you to employ new tactics. As the windflare intensity increases, each enemy confrontation evolves into a brutal fight for survival in this tale of Man vs. Monster. New Arsenal of Weapons and Combat Tactics: Pummel your enemies from cover with new close-cover combat moves like yank, vault kick and a bloody new combat-knife execution. Make use of dangerous new weapons, like the Buzzkill and Dropshot, to shoot around and over cover, raining destruction from all angles. The Best “Gears” Multiplayer Experience Yet: Whether you enjoy powering through the co-op Campaign, fending for survival in Horde mode or testing your skills in frenetic Versus Multiplayer matches running in 60 FPS on dedicated servers, “Gears of War 4” is the ultimate game to play with friends. Explosive Versus Multiplayer Action: Compete in intense multiplayer gametypes that reward social, competitive and professional players alike, including new modes like Dodgeball and the premier new competitive “Gears” multiplayer mode, Escalation. Track your progress with the new visible ranking system that drives online matchmaking and lets you stand out for your abilities. The Next Generation of Horde: Team up with up to four other players and weather the onslaught using class-based skills and dynamic fortifications. For the first time, you can build and deploy defensive weapons and fortifications anywhere on the map. Play with Friends Against AI Foes: Fine-tune your skills in Co-Op Versus, where your match-made team of five squares off against increasingly punishing AI teams. The Complete “Gears of War” Collection: For a limited time, “Gears of War 4” (both digital and retail versions) will include the entire Xbox 360 “Gears of War” collection. Play through the original “Gears of War” trilogy and “Gears of War: Judgment” on Xbox One via backwards compatibility, amounting to over 50 hours of “Gears of War” gameplay. Gears of War 4 launches October 11 for XBox and PC. It doesn’t matter which one you choose, because Gears 4 is part of Microsoft’s Play Anywhere campaign that gives you both instantly. There will also be a limited-edition Elite controller with Gears of War-paint available the same day.